If you are not the intended recipient of this message, please do not distribute or copy the information contained in this e-mail, but instead, delete and destroy all copies of this e-mail. DISCLAIMER The information contained in the electronic copy of the Offering Circular has been formatted in a manner which should exactly replicate the printed Offering Circular; however, physical appearance may differ and other discrepancies may occur for various reasons, including electronic communication difficulties or particular user equipment. The user of this Offering Circular assumes the risk of any discrepancies between the printed Offering Circular and the electronic version of this document. 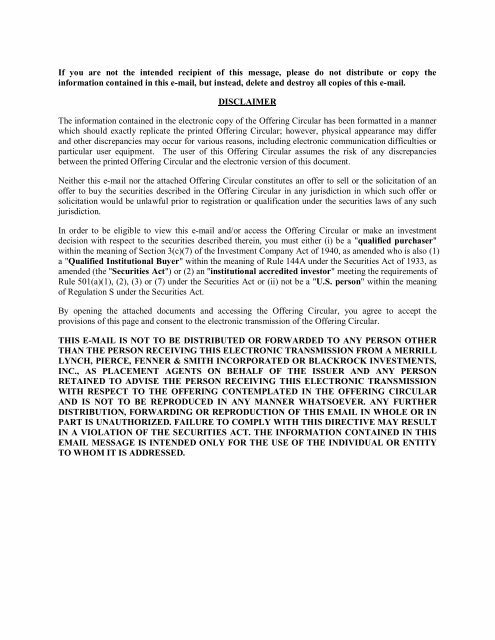 Neither this e-mail nor the attached Offering Circular constitutes an offer to sell or the solicitation of an offer to buy the securities described in the Offering Circular in any jurisdiction in which such offer or solicitation would be unlawful prior to registration or qualification under the securities laws of any such jurisdiction. In order to be eligible to view this e-mail and/or access the Offering Circular or make an investment decision with respect to the securities described therein, you must either (i) be a "qualified purchaser" within the meaning of Section 3(c)(7) of the Investment Company Act of 1940, as amended who is also (1) a "Qualified Institutional Buyer" within the meaning of Rule 144A under the Securities Act of 1933, as amended (the "Securities Act") or (2) an "institutional accredited investor" meeting the requirements of Rule 501(a)(1), (2), (3) or (7) under the Securities Act or (ii) not be a "U.S. person" within the meaning of Regulation S under the Securities Act. By opening the attached documents and accessing the Offering Circular, you agree to accept the provisions of this page and consent to the electronic transmission of the Offering Circular. THIS E-MAIL IS NOT TO BE DISTRIBUTED OR FORWARDED TO ANY PERSON OTHER THAN THE PERSON RECEIVING THIS ELECTRONIC TRANSMISSION FROM A MERRILL LYNCH, PIERCE, FENNER & SMITH INCORPORATED OR BLACKROCK INVESTMENTS, INC., AS PLACEMENT AGENTS ON BEHALF OF THE ISSUER AND ANY PERSON RETAINED TO ADVISE THE PERSON RECEIVING THIS ELECTRONIC TRANSMISSION WITH RESPECT TO THE OFFERING CONTEMPLATED IN THE OFFERING CIRCULAR AND IS NOT TO BE REPRODUCED IN ANY MANNER WHATSOEVER. ANY FURTHER DISTRIBUTION, FORWARDING OR REPRODUCTION OF THIS EMAIL IN WHOLE OR IN PART IS UNAUTHORIZED. FAILURE TO COMPLY WITH THIS DIRECTIVE MAY RESULT IN A VIOLATION OF THE SECURITIES ACT.  THE INFORMATION CONTAINED IN THIS EMAIL MESSAGE IS INTENDED ONLY FOR THE USE OF THE INDIVIDUAL OR ENTITY TO WHOM IT IS ADDRESSED.